Arne L. Kalleberg and Steven P. Vallas (editors). 2018. Precarious Work: Causes, Characteristics, and Consequences. (Research in the Sociology of Work Volume 31). Bingley UK: Emerald. ISBN 978-1-78743-288-8 (cloth). This volume presents original theory and research on precarious work in various parts of the world, identifying its social, political, and economic origins, its manifestations in the USA, Europe, Asia, and the Global South, and its consequences for personal and family life. In the past quarter century, the nature of paid employment has undergone a dramatic change due to globalization, rapid technological change, the decline of the power of workers in favor of employers, and the spread of neoliberalism. Jobs have become far more insecure and uncertain, with workers bearing the risks of employment as opposed to employers or the government. This trend toward precarious work has engulfed virtually all advanced capitalist nations, but unevenly so, while countries in the Global South continue to experience precarious conditions of work. 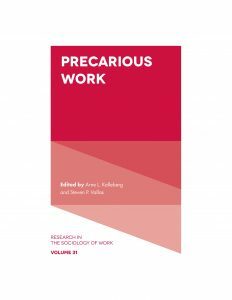 This book examines theories of precarious work; cross-national variations in its features; racial and gender differences in exposure to precarious work; and the policy alternatives that might protect workers from undue risk. The chapters utilize a variety of methods, both quantitative statistical analyses and careful qualitative case studies. This volume is a useful resources for scholars, activists, labor leaders, and policy makers concerned with the future of work under contemporary capitalism.